Recently, there has been an increased national awareness and growing concern for formaldehyde gas being released from manufactured laminated flooring and other composite wood products. The adhesives and sealants used in many of these products may contain formaldehyde and this formaldehyde vapor can off-gas from the finished product even after it has been installed in a home. 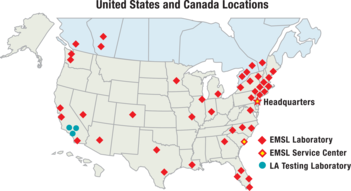 Many of these products are safety-rated to European and/or California standards for formaldehyde off-gassing levels. However, recent investigations have shown that formaldehyde off-gassing can still be of a concern from some of these products. They can even be elevated above acceptable levels that they are listed as meeting. Formaldehyde gas is highly toxic and a confirmed human carcinogen. Even at lower exposure levels, formaldehyde gas can cause eye and nasal irritation, headaches and aggravate asthma conditions. EMSL Analytical, Inc. can assist you with formaldehyde testing and analyses to help you better evaluate the potential formaldehyde hazards from your composite wood products. Provide EMSL with a 2 inch by 2 inch square piece of the composite wood product and place in a sealed plastic bag. At EMSL, each sample is placed into a glass vial and an air sample is collected from air passing over the flooring product. The air sample collected is evaluated to determine the parts per million (PPM) amount of formaldehyde off-gassing concentration in the air from the composite wood product. Note: This testing cannot be used for CARB ATCM Phase II or European product compliance. This testing can show if detectable formaldehyde levels occur from your composite wood product and can be reviewed against current formaldehyde guidelines for air concentrations and off-gassing amounts. Provide EMSL with an intact 2 foot by 2 foot square piece (no larger sizes please) of the composite wood product and wrap in plastic. Each sample is placed into small sample chamber by EMSL. After a 24-hour equilibration period, an air sample is collected from the chamber. This air sample is evaluated to determine concentration in PPM from formaldehyde off-gassing from the composite wood product as well as the formaldehyde emissions rate from the surface of the flooring (µg/m2-hr). EMSL will provide you with an easy-to-use passive room sampler (air monitoring badge) to measure the formaldehyde level in your home. Ideally, you can place a badge(s) in the room(s) where the laminated flooring products are installed and let it run for a 24-hour sampling period. After completion, return the used badge(s) to EMSL in the mailer provided and the lab can provide you with the formaldehyde concentration levels in PPM in your home. 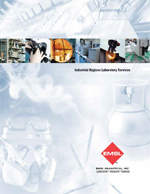 Note: This testing cannot be used for OSHA, CARB, NIOSH, or EPA regulatory compliance. In addition, other formaldehyde sources can be present such as household products, carpeting, furniture, and cabinetry that can contribute to the airborne formaldehyde levels. These test results can be used to establish if elevated formaldehyde levels exist in the room(s) tested. *Please send ASTM D6007 -14 Small Chamber Study (intact composite wood samples) to the Cinnaminson, NJ lab only. One week turnaround for this test must be scheduled in advance prior to submitting samples. Please contact us at 1-800-220-3675 or 1-888-958-8170 if we can be of any additional help. 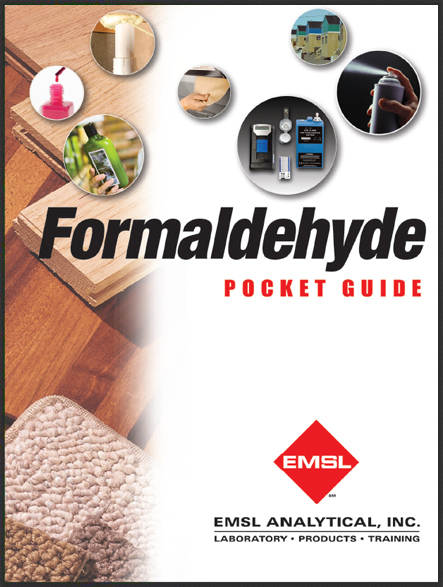 Click here to download a PDF copy of EMSL's Formaldehye Pocket Guide. Visit our dedicated Formaldehyde Testing website at www.formaldehydetesting.com.